I want to amplify the last point from the previous post, about anti-financialization. If we go back to the beginning of the national accounts in 1929, we find personal consumption accounts for around 75% of GDP. (This is true whether or not we make the C&F adjustments, since in 1929 the imputed and third-party component of consumption were either nonexistent or small.) During the Depression, the consumption share rises to 85% as business investment collapses, during the war it falls to below 50%, and it rises back to around two-thirds after 1945. It’s in the second half of the 1940s, with the growth of pension and health benefits and the spread of homeownership, that we start to see a large wedge between headline consumption and actual cash expenditures by households. We can think of the ratio of adjusted consumption to GDP as a measure of how marketized the economy is: How much of output is purchased by people for their own use, as opposed to allocated in some other way? In this sense, the steady fall in adjusted consumption as a share of GDP represents a steady retreat of capitalist production in the postwar US. It was squeezed from both sides: from “above” by public provision of health care, education and retirement security, and from “below” by the state-fostered growth of self-provision in housing. Consumption spending by households bottomed out at 47 percent of GDP in 1981. With the neoliberal turn, the process of de-marketization largely halted — but it did not reverse. Since then, consumption spending by households has hovered around 47-48% of GDP. The phenomena of household financialization, “markets for everything,” etc. are real — but only at the level of ideology. Private life in the US has not become more commodified, marketized or financialized in recent decades; over a longer horizon the opposite. What has happened is that a thickening veneer of fictional market transactions has been overlaid on a reality of social consumption. In reality, neither collective provision of health care (or of education, public safety, etc.) nor self-provision of housing has been replaced to any noticeable degree by market purchases. What we’ve had, instead, is the statistical illusion of rising private consumption spending — an illusion fostered by the distortion of the national accounts by the dominant economic theory. When health insurance is purchased collectively by government or employers, the national accounts pretend that people were paid in cash and then chose to purchase health coverage individually. When retirement savings are carried out collectively by government or employers, the national accounts pretend that people were paid in cash and then chose to purchase financial assets. When people buy houses for their own use, the national accounts pretend they are profit-maximizing landlords, selling the use of their houses in the rental market. When liquidity constraints force people to hold financial wealth in low-yield forms, the national accounts pretend that financial markets are frictionless and that they are receiving the market yield in some invisible form. Together, these fictional transactions now make up 20 percent of GDP, and fully a third of apparent household consumption. Of course, that might change. The decline of homeownership and the creation of a rental market for single-family homes may turn the fiction of a housing sector of tenants and profit-seeking landlords into a reality. One result of Obamacare — intended or otherwise — will be to replace collective purchases of health insurance by employers with individual purchases by households. Maybe the Kochs and Mark Zuckerberg will join forces and succeed in privatizing the schools. But none of that has happened yet. What’s striking to me is how many critics of contemporary capitalism — including Cynamon and Fazzari themselves — have accepted the myth of rising household consumption, without realizing there’s no such thing. The post 1980s rise in consumption is a statistical artifact of the ideology of capitalism — a way of pretending that a world of collective production and consumption is a world of private market exchange. Did you know that about 10 percent of private consumption in the US consists of Medicare and Medicaid? Despite the fact that these are payments by the government to health care providers, they are counted by the BEA both as income and consumption spending for households. I bet you didn’t know that. I bet plenty of people who work with the national income accounts for a living don’t know that. I know I didn’t know it, until I read this new working paper by Barry Cynamon and Steve Fazzari. I’ve often thought that the best macroeconomics is just accounting plus history. This paper is an accounting tour de force. What they’ve done is go through the national accounts and separate out the components of household income and expenditure that represent cashflows received and made by households, from everything else. – $1.2 trillion was imputed rents on owner-occupied housing. The national income and product accounts treat housing on the principle that the real output of housing should be the same whether or not the person living in the house happens to be the same person who owns it. So for owner-occupied housing, they impute an “owner equivalent rent” that the resident is implicitly paying to themselves for use of the house. This sounds reasonable, but it conflicts with another principle of the national accounts, which is that only market transactions are recorded. It also creates measurement problems since most owned residences are single-family homes, for which there isn’t a big rental market, so the BEA has to resort to various procedures to estimate what the rent should be. One result of the procedures they use is that a rise in hoe prices, as in the 2000s, shows up as a rise in consumption spending on imputed rents even if no additional dollars change hands. 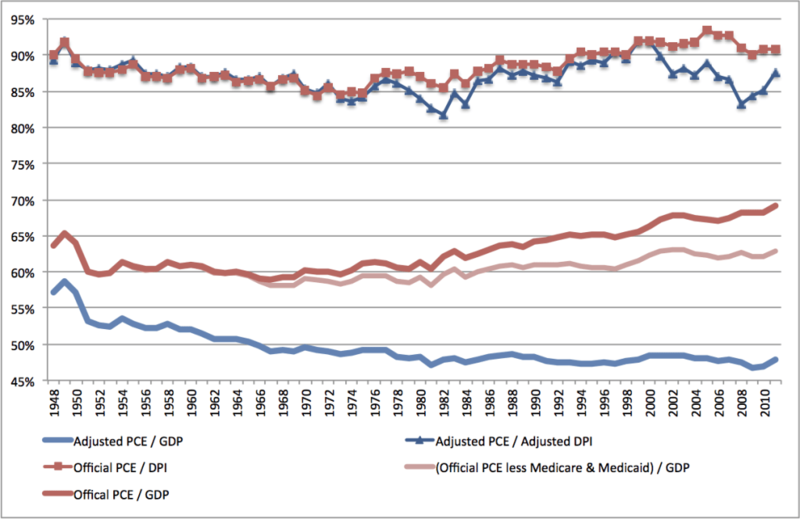 – $970 billion was Medicare and Medicaid payments; another $600 billion was employer purchases of group health insurance. The official measures of household consumption are constructed as if all spending on health benefits took the form of cash payments, which they then chose to spend on health care. This isn’t entirely crazy as applied to employer health benefits, since presumably workers do have some say in how much of their compensation takes the form of cash vs. health benefits; tho one wouldn’t want to push that assumption that too far. But it’s harder to justify for public health benefits. And, justifiable or not, it means the common habit of referring to personal consumption expenditure as “private” consumption needs a large asterix. – $250 billion was imputed bank services. The BEA assumes that people accept below-market interest on bank deposits only as a way of purchasing some equivalent service in return. So the difference between interest from bank deposits and what it would be given some benchmark rate is counted as consumption of banking services. – $400 billion in consumption by nonprofits. Nonprofits are grouped with the household sector in the national accounts. This is not necessarily unreasonable, but it creates confusion when people assume the household sector refers only to what we normally think of households, or when people try to match up the aggregate data with surveys or other individual-level data. Take these items, plus a bunch of smaller ones, and you have over one-quarter of reported household consumption that does not correspond to what we normally think of as consumption: market purchases of goods and services to be used by the buyer. 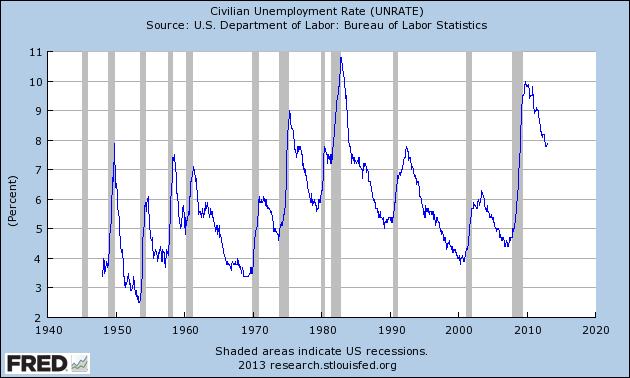 The adjustments are even more interesting when you look at trends over time. Medicare and Medicaid don’t just represent close to 10 percent of reported “private” consumption; they represent over three quarters of the increase in consumption over the past 50 years. More broadly, if we limit “consumption” to purchases by households, the long term rise in household consumption — taken for granted by nearly everyone, heterodox or mainstream — disappears. By the official measure, personal consumption has risen from around 60 percent of GDP in the 1950s, 60s and 70s, to close to 70 percent today. While there are great differences in stories about why this increase has taken place, almost everyone takes for granted that it has. But if you look at Cynamon and Fazzari’s measure, which reflects only market purchases by households themselves, there is no such trend. Consumption declines steadily from 55 percent of GDP in 1950 to around 47 percent today. In the earlier part of this period, impute rents for owner occupied housing are by far the biggest part of the difference; but in more recent years third-party medical expenditures have become more important. Just removing public health care spending from household consumption, as shown in the pal red line in the figure, is enough to change a 9 point rise in the consumption share of GDP into a 2 point rise. In other words, around 80 percent of the long-term rise in household consumption actually consists of public spending on health care. In our “Fisher dynamics” paper, Arjun Jayadev and I showed that the rise in debt-income ratios for the household sector is not due to any increase in household borrowing, but can be entirely explained by higher interest rates relative to income growth and inflation. For that paper, we wanted to adjust reported income in the way that Fazzari and Cynamon do here, but we didn’t make a serious effort at it. Now with their data, we can see that not only does the rise in household debt have nothing to do with any household decisions, neither does the rise in consumption. What’s actually happened over recent decades is that household consumption as a share of income has remained roughly constant. Meanwhile, on the one hand disinflation and high interest rates have increased debt-income ratios, and on the other hand increased public health care spending and, in the 2000s high home prices, have increased reported household consumption. But these two trends have nothing to do with each other, or with any choices made by households. There’s a common trope in left and heterodox circles that macroeconomic developments in recent decades have been shaped by “financialization.” In particular, it’s often argued that the development of new financial markets and instruments for consumer credit has allowed households to choose higher levels of consumption relative to income than they otherwise would. This is not true. Rising debt over the past 30 years is entirely a matter of disinflation and higher interest rates; there has been no long run increase in borrowing. Meanwhile, rising consumption really consists of increased non-market activity — direct provision of housing services through owner-occupied housing, and public provision of health services. This is if anything a kind of anti-financialization. The Fazzari and Cynamon paper has radical implications, despite its moderate tone. It’s the best kind of macroeconomics. No models. No econometrics. Just read the damn tables, and think about what the numbers mean.